UPDATE: Both vehicles involved in this wreck have been cleared from the scene and the spilled fuel has been cleaned up. Crews with the city’s Traffic Engineering Department are in the process of making repairs to a traffic signal pole that was damaged in the wreck. Police officers remain on the scene to assist with directing traffic through the Barksdale/Walker Place intersection while repairs to the damaged traffic signal police are made. The eastbound lanes of Walker Place from CenturyLink Drive to Barksdale Boulevard remain closed to traffic however the westbound lanes of Walker Place from Barksdale to the ART Parkway are open. 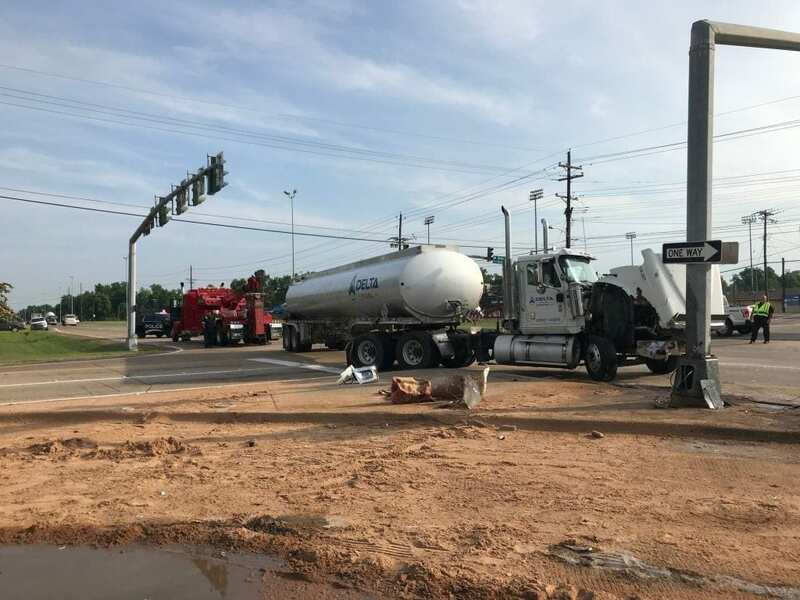 Bossier City police are currently working a motor vehicle crash at the intersection of Barksdale Boulevard and Walker Place that has resulted in a fuel spill and delaying traffic at that location. The crash happened just before 7 AM when a pick up truck turning left onto Walker Place from northbound Barksdale Boulevard was hit by a taker truck that was heading south on Barksdale Blvd. There were no injuries reported however approximately 200 gallons of diesel fuel spilled after a saddle bag fuel tank on the tanker truck ruptured. The tanker truck was hauling a full load of diesel fuel however the trailer was not damaged. Bossier City Fire Department personnel responded to the scene and were able to keep the spilled fuel contained in a small area at the crash site. It’s expected to take a few hours to clean up the spilled fuel and clear the scene. In the meantime Walker Place between Barksdale Boulevard and CenturyLink Drive is closed to traffic. Southbound Barksdale Boulevard is also temporarily reduced to one lane of traffic. The driver of the pick up truck was cited for failure to yield.